In the 1850s and 1860s a number of provinces ran schemes offering free or assisted passages for immigrants from Britain and Ireland. Single women were especially preferred, to become wives or domestic servants for the settlers. 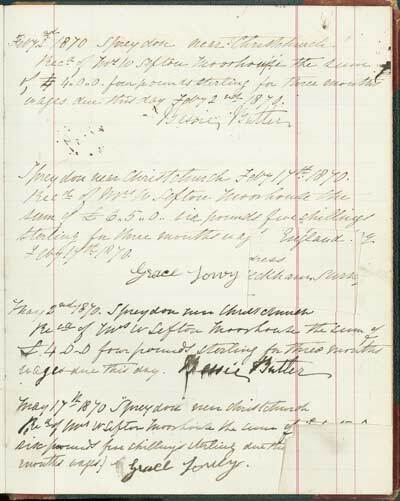 This wage book records the amounts paid to Bessie Butler and Grace Lowry by the respectable Christchurch woman Jane Anne Moorhouse. She was the wife of William Moorhouse, former superintendent of Canterbury province.